Two emerging and established researchers from the Faculty of Liberal Arts and Professional Studies (LA&PS) will join the York Research Chairs (YRC) program, York University’s internal counterpart to the national Canada Research Chairs (CRC) program, which recognizes outstanding researchers. The newly appointed YRCs belong to the fifth cohort of researchers to be appointed since the establishment of the program in 2015. 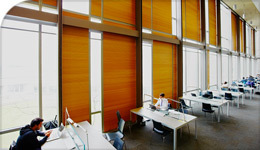 The program is designed to build, support and intensify the world-renowned research underway at York University. The YRC program is aimed at building research recognition and capacity, with excellence in research, scholarship and associated creative activity serving as selection criteria. Standards, expectations and supports for YRCs are at the same level as for the CRC program. This program is designed to recognize excellence that is already in existence at York, and to support the programs of the University’s most active researchers. “The YRC program mirrors the federal CRC program, to broaden and deepen the impact of research chairs at York in building and intensifying world-renowned research across the institution. These new YRCs are undertaking visionary work that has local, national and international impact,” said Vice-President Research and Innovation Robert Haché. Tier I YRCs are open to established research leaders at the rank of full professor. Tier II YRCs are aimed at emerging research leaders within 15 years of their first academic appointment. Both have five-year terms that are renewable in the context of open competition, based on peer review and the continuing availability of resources. Jacobs is professor and director of the Institute for Social Research at York University where he teaches political science and law and society in the Faculty of Liberal Arts & Professional Studies, as well as in the graduate program of Law at Osgoode Hall Law School and the graduate program in socio-legal studies. He was elected a Fellow of the Royal Society of Canada in 2017 for his contributions in Canada and abroad to human rights and access to justice. Appointed as a Tier I Chair, he will focus his research on establishing an innovative Access to Justice Research Lab, which will serve as an incubator for the most impactful primary empirical research on access to justice in Canada. Beck is an associate professor of philosophy in the Faculty of Liberal Arts & Professional Studies, and is also a member of the Cognitive Science Program, the Centre for Vision Research and the Vision: Science to Applications (VISTA) program. Appointed as a Tier II Chair, he has research interests that include the study of mental representation and consciousness from an empirically informed philosophical perspective. Most of his current research centres on three issues: the format of mental representation, the perception–cognition boundary, and how consciousness and representation interrelate.